Under § 478.45, Renewal of License, if a licensee intends to continue the business or activity described on a license issued under this part during any portion of the ensuing year, the licensee shall, unless otherwise notified in writing by the Chief, FFLC, execute and file with ATF prior to the expiration of the license an application for a license renewal, ATF Form 8 Part II, in accordance with the instructions on the form, and the required fee. In the event the licensee does not timely file an ATF Form 8 Part II, the licensee must file an ATF Form 7 as required by § 478.44, and obtain the required license before continuing business. A renewal application will automatically be mailed by ATF to the "mailing address" on the license approximately 90 days prior to the expiration of the license. If the application is not received 30 days prior to the expiration date, the licensee should contact the FFLC. When you have sent your Federal Firearms License (FFL) Renewal Application, ATF Form 8 Part II, to ATF prior to the expiration of your federal firearms license and the application form has been postmarked before the expiration date, you may request a Letter of Authorization (LOA) from the Federal Firearms Licensing Center (FFLC) to facilitate and carry on your business operations while your renewal application is in a pending status. 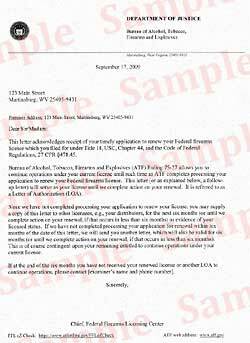 The LOA provides evidence to your distributors that you may continue your business operations under your current license until ATF has completed the processing of your renewal application, even if the time needed by ATF to process the application extends beyond the expiration date of the current license. The LOA will state that operations may continue under the existing license for a period of up to six months. If the FFLC does not complete processing of the application within the six month period specified in the LOA, you may request the FFLC to extend the LOA. You may also provide copies of the LOA to your suppliers.